The local college baseball scene in Philadelphia is packed with talent and there's quite a few things to look forward to at the top college level this season. 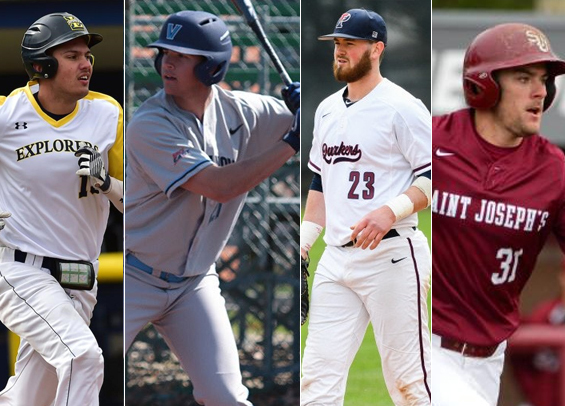 Penn is equipped to compete for an Ivy League pennant right now, and Saint Joseph's is coming off a 21 win season. La Salle and Villanova are both coming off tough campaigns, but there's an excitement surrounding both programs as they continue to rebuild. Listed below is our Philadelphia Baseball Review All-Philadelphia Region NCAA D-1 Preseason Team. Like last year, we'll award weekly honors on Monday's to celebrate the best local efforts at the D-1 level. Team previews will be published throughout the week. Catcher: James McConnon (SR) | Saint Joseph's - Ranked second on the Hawks last season in batting average (.288), on-base percentage (.351), and doubles (7), third in hits (44) and slugging percentage (.346), and fourth in runs batted in (16). Also made 40 starts for SJU all behind the plate, committing only one error while posting a .996 fielding percentage. Third base: Matt McGeagh (SR) | Penn - Named First-Team All-Ivy and All-Big 5 last year, he hit .299 (53-of-177) with an Ivy high 43 RBIs. He also scored 28 runs scored, hit 12 doubles, and clobbered a team-best 7 home runs. Shortstop: Chris Adams (JR) | Penn - Posted a .292 (50-of-171) batting average with 13 doubles and 14 RBIs while hitting mostly out of the lead-off spot. Notched 12 multi-hit games on the year for the Quakers. Stole a team-leading nine bases. Outfielder: Charlie Concannon (SR) | Saint Joseph's - Led the Hawks last season in batting average (.317), hits (57), doubles (11), runs batted in (29), slugging percentage (.483), and on-base percentage (,393). Outfielder: Tyler Bruno (JR) | Villanova - Started 40 games for the Wildcats and hit .241 on the season to go along with 21 RBIs and 55 total bases. Named to the BIG EAST All-Academic Team in each of his first two seasons. Outfielder: Ben Faso (SR) | La Salle - Collected 75 hits for the Explorers last year en route to an outstanding 2018 campaign. Named Philadelphia Big 5 Co-Player of the Year and Philadelphia Baseball Review Offensive Player of the Year, he hit .347 with three homers and 36 RBIs. He hit safely in 42 games and had 20 multi-hit games, also swiped nine bases. Designated hitter: Ryan Toohers (JR) | Villanova - Named to the Preseason All-Big East Team, he led or tied for the team lead in eight different offensive categories last season including a .472 slugging percentage with five home runs. Pitcher: Christian Scafidi (JR) | Penn - Ranked second on the Quakers in both strikeouts (52) and innings pitched (61.2). Will likely hold top spot in starting rotation. Was named Coastal Plains League Pitcher of the Year this past summer.